The appearance of dandruff is unsightly and often very difficult to get rid of. However, there are ways and means to alleviate and treat dandruff. Dandruff refers to dead skin cells, that are rejected by the body. Normally they are invisible. However, when there is an increase in the rejection of these dead skin cells they become visible and are very unsightly. Dandruff occurs when the scalp is out of balance. The goal of any treatment is to regulate and harmonize the scalp in order for it to perform its normal function again. The nature of the optimal treatment also depends on what causes dandruff. These causes can, in fact, be manifold. Dry scalp leads to dry, white scales. One reason may be related to dry heated air especially during the winter months in overheated rooms. Additionally, microorganisms such as bacteria and fungi can cause dandruff. They feed on the fat of the sebaceous glands, causing the increase in dandruff. Lastly, dandruff can be caused by health problems, illness or side effects of medication. In such cases, it is best to seek medical attention. Dandruff occurs in various forms. When the sebaceous glands fail to perform their function, dry dandruff can arise. Consequently, when the sebaceous glands produce are "overactive", oily dandruff may become more apparent. Oily hair at the hairline and scalp infection result in a combination of the two forms of dandruff. How can dandruff be alleviated? 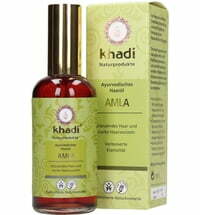 The appearance of dandruff can be reduced by paying attention to a healthy, balanced and especially nutrient-rich diet. 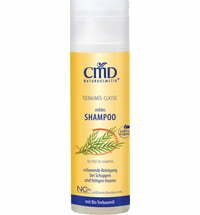 Many natural cosmetic shampoos may also help fight dandruff since they do not contain harmful chemicals. Be wary of conventional shampoos as these irritate the scalp, and can certainly lead to increased oiliness and dandruff. A vicious circle. When converting from conventional to natural cosmetics, in this case, shampoos, it may take a few weeks until the scalp has become accustomed. The skin may require a transition phase whereby results are not visible instantaneously. This is quite normal. Natural substances have a different effect as opposed to many chemical-laden products and may require more time to show its effect on the skin. 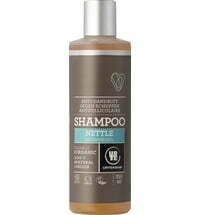 In addition, many people feel that their hair feels somewhat different or more greasy when using a natural shampoo. This is because conventional shampoos strip the hair and scalp from any oiliness and moisture, and the sebaceous glands produce more oil more rapidly. Although natural shampoos degrease as well, they are less aggressive on the hair and scalp. It takes time for the sebaceous glands to adapt. As an alternative to shampoo, the use of clays is recommended. Clays have the effect of minimally degreasing the hair and scalp, yet still providing a thorough cleanse for a natural regulation of the sebaceous glands.